Water Heater Napa, CA | A+ Waterworks, Inc.
A water heater in Napa, CA is an important system in your house. Property owners like you need to be on the lookout for common problems that you may encounter with a water heater in Napa, California. Once you identify these problems, it may be best for you to contact the professionals. Residential and commercial clients commonly contact professionals when their water heater in Napa, CA is completely out of service. This happens when a water heater in Napa, CA powered by gas or electricity cannot generate heat. Do not attempt to fix your water heater in Napa, California if you are uncertain about how to do it. Sometimes, your water heater in Napa, CA may fail when you least expect it. If this happens, it will be best to have a company that can help you at any time of the day. Our business is available 24/7 for any issues with your plumbing, including your water heater in Napa, CA. Water leaks are one of the most common issues with a water heater in Napa, CA. Reasons may include a damaged valve, corrosion buildup, or excess pressure inside the tank. For leaks, contact our skilled plumber at A+ Waterworks, and save yourself the hassle of fixing them yourself. We can repair your system in no time. In some cases, your water heater in Napa, CA may not be big enough to supply the growing needs of your household or commercial space. For example, if you have installed additional bathtubs or showerheads, you might need a bigger and a more powerful water heater in Napa, CA. For repairs or upgrades of a water heater, Napa, CA residents like you may get in touch with A+ Waterworks. Our plumbers are looking forward to helping you with your water heater in Napa, CA. With constant use, solid residues will accumulate inside the tank of your water heater in Napa, CA. The sediment buildup makes it difficult for your water system to work. When your water tank starts making unusual noises, you may try draining the tank. If the sediments are too big, it may be difficult to flush them out using the valves. Leave it to professionals who can fix or replace the water heater in Napa, CA—turn to our technicians at A+ Waterworks. You may also visit our office at 194 Camino Oruga, Ste. 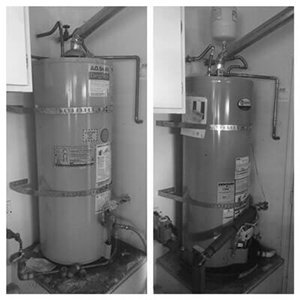 13, Napa, CA 94558 so we can discuss your concerns with your water heater in Napa, CA. Our business is open from Monday to Friday, 8:30 a.m. to 5:00 p.m. For emergency cases, we are also available 24/7. Note that we may charge additional fees. A piece of real estate is one of the biggest, most important assets we can acquire. Any water repair or modification made to it should be of the highest quality to ensure the security of our finances. When it comes to professional plumbing, fire system installation, and sanitation services for residential and commercial clients, turn to A+ Waterworks. We have been serving the North Bay area of California since 1994 and have been hailed as one of the best in the water heater repair industry. We specialize in a variety of residential and commercial plumbing services, and never sacrifice quality for quantity. From fixing minor leaks in houses to maintaining the plumbing system of an industrial warehouse facility, our plumbers will allot the same amount of care and attention to every repair and installation project we do. A+ Waterworks looks forward to creating long-term relationships with every client by ensuring customer satisfaction with every plumbing order.